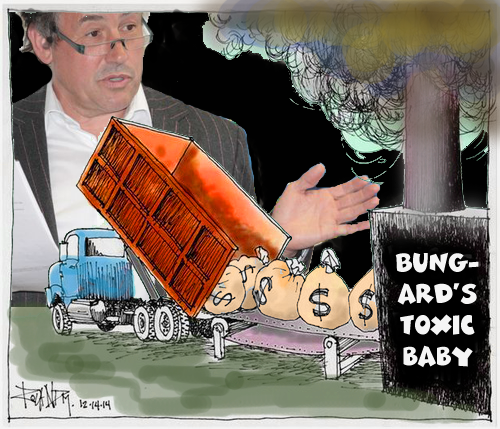 We always knew that there must be something GCC was hiding by dragging out every challenge, and challenging every request for information about the incinerator. Turns out they flouted procurement law and should have re-tendered the contract in 2015 - and Community R4C is, as you know, challenging GCC in the High Court over this. BUT THERE'S MORE. Now we know HOW they avoided re-tendering... by ensuring the Scrutiny Committee voted not to do its own job properly. Community R4C has uncovered an incident that took place on the eve of that key vote in November 2015. The council's CEO Peter Bungard requested a private meeting with Brian Oosthuysen, chair of the Scrutiny Committee at the time, and told him he must use his casting vote to prevent full council scrutiny of the revised contract, “or else it will cost the Council £100M” (presumably the cost of cancellation, although we now know this was in fact only £60M at the time). He somehow failed to mention the £150M it would now additionally cost the council to continue with the revised contract. He forgot to say that the council was breaking procurement law by failing to re-tender. And Brian Oosthuysen, just like us, did not know any of that until now. Quite rightly, Brian is in communication with the police about the incident, and a criminal investigation is under way. So it now appears that GCC could be facing both civil and criminal court cases over this contract. Community R4C explains that the civil case could be particularly important with respect to "state aid" rules. Under these, if the court finds GCC did unfairly privilege UBB above market rates, UBB may have to return the difference to the public purse... and the contract may need to be re-examined. Now that is something worth fighting in court for. We reckon this is pretty amazing all round, and Community R4C is hoping that lots of people will contribute to taking the High Court case forward. If you feel like supporting even in a small way, go to the CrowdJustice page where you will find a good summary (as well as a couple of brilliant supporting quotes from Jonathon Porritt and Jeremy Irons). Things are moving... and not before time. Keep watching this space, checking out @NoMoInGlo on FB and Twitter and sharing.